Sunday, February 5, 2012. It’s a chocolate Sunday—a big day for chocolate and football. I doodled this image using ArtRage Studio Pro and then finishing it in Xara Designer Pro 7. My laptop keys are now sticky with a chocolaty hazelnut goodness. © 2012 Steph Abbott. All rights reserved. Hi Steph . . . Aunt Lynn here . . . and I was viewing you chocolate pic, except there is no pic . . . just a black box with a drop shadow . . . something is wrong with the setup or my new mac air book is not feeling well. I’m sure that it is a sight to see . . . the picture I mean. Love ya . . .
Hi, Aunt Lynn! It’s a bar of chocolate with footballs. 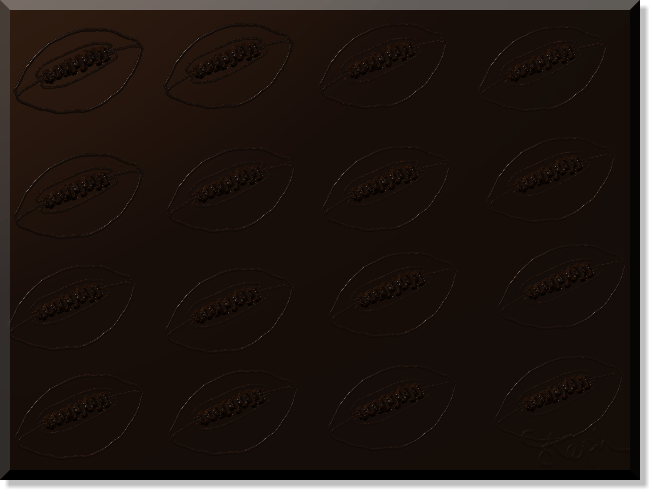 It must be dark chocolate. The design is a bit difficult to see on my iPad now that I look at it. It wasn’t so dark when I doodled it this morning. Weird. Anyways, thanks for dropping by. I’m trying to create an image a day for the month of February. Most of my posts are doodle in about 10-15 minutes in the mornings before going to work.